Vi Miere mists are individually hand-crafted from a combination of crystal, mineral, nature and flower essences. Vi Miere mists are created for both people and animals for finding better balance, pain relief, and inner peace. Many people enjoy using the mists to enhance their spiritual practice. Personal customized mists can be made to order. Click here to schedule your complimentary meeting with Vicki to find the best Vi Miere services and products for supporting your optimal health and well-being. Vi Miere's Complete Line with Packages - 75 essences includes: Full line of 60 individual 1 oz essences plus the chakra set (set of 8 - oz essences including CD) and Feng Shui (set of 3 - 2 oz essences) and 5 Element (set of 5 - 1 oz essences) packages. Your Personal Formulation - Your custom vibrational healing essence formulated for you specifically. Consultation provides thorough Get to Know session geared toward ongoing vibrational wellness with Vi Miere. We establish a baseline, get to the core layers, clear and balance, setting you up for continued healing at the cellular level and benefiting your ongoing growth, wellness and expansion. Healing You Essence Reading- You receive a personal 30 minute healing and essence reading. You are going deeper and clearing out issues or blocks no longer serving you that are preventing you from being and living your best. You receive 3 - 1oz essences that specifically target your core issues for optimum healing. Abundance - Spray for what you want more of i.e. friends, sunny days, romance, money, commercial business, and more. Alignment - Aligns us with all that "IS" for us. Allergy Relief - Assists relieving allergy sypmptoms. Arthritis Ease - Alleviates symptoms of arthritis. Athlete - Dissipates pain, enhances athletic ability. This mist is designed for athletes and athletic competition to help take the edge off any pain, yet keeps the body intact for competition. This aids the body in recovering after performance as well. Awaken - A non-caffeinated, quick pick-me-up. Also awakens one for living life more fully. Great for use after trauma, illness, power outages, and coming out of a bad relationship. Boundaries - Helps set and maintain personal boundaries with ourselves and others. Cellular Tonification - Supports cellular health and protection. Chakra Set- Chakras 1-7 Plus Sacred Initiation Essence and Chakra Meditation CD - The Sacred Initiation Essence and the healing Meditation CD come exclusively with the chakra set. The chakra set was created to clear and balance your chakras in 20 minutes for ease of regular in-depth clearing. The CD guides you through the chakra balancing process with ease. While listening to the CD, the chakras are being balanced with the singing crystal bowls for each chakra. You are guided when to spray the essences for balancing of each chakra. You get sound healing as well as the essence healing for in-depth balancing. The Sacred Initation Essence is designed to use when concluding your chakra clearing and balancing session, sealing and protecting this new energetic state you have entered. Don't have time for the full balancing, the chakras can be balanced individually with the essences! Chakra 1 - Root Chakra - Assists clearing and balancing the root/base chakra. Chakra 2 - Sacral Chakra - Assists clearing and balancing our sexuality. Chakra 3 - Solar Plexus Chakra - Assists clearing and balancing our ability to manifest. Chakra 4 - Heart Chakra - Assists clearing and balancing matters of the heart. Chakra 5 - Throat Chakra - Assists clearing and balancing ability to speak our truth. Chakra 6 - Third Eye Chakra - Assists clearing and balancing our clarity of vision. Chakra 7 - Crown Chakra - Assists clearing and balancing our spirituality. Clarity - Opens clarity in vision and thought. Clear - Clears and expands one's energy field. Communicate - Supports clarity and creativity in communication. Confidence - Enhances feelings of personal power and love. Core Issues - Brings forth deep issues for clearing. Create* - Provides joyful inspiration and movement toward one's true desires. *Actual ruby crystal in essence. Desires - Aligns desires on all levels. Digestion Ease - Digest meals and life with ease. Assists physical digestion and emotional digestion in everyday life. Use before meals, especially when going to fast food places. Divine Spine - Helps bring comfort and support to one's spine and its innate ability for self-correcting. Empowerment - Brings potential to fruition. Energy Balance - Balances and expands aura, chakras and meridians. Enlightenment* - Assists in opening a Divine portal to our true essence in its purest form. *Actual ruby crystal in essence. Environmental Oneness - Assists reconnecting us with "All-That-IS", diffusing any sense of separation. Expansion - Assists in expanding oneself into "claiming one's space" and reaching one's full potential. Good for claustrophobic people, airport travelers, holiday shoppers, cubicle workers, or anyone needing more personal space. Family - Promotes harmony and supports change within the home. Female - Balances hormones, aids in relieving PMS and menopausal symptoms. Focus - Dissipates disturbances allowing one to focus. Forgiving - Assists in forgiving and letting go, allowing us to live our fullest expression. Gentle Parenting - Supports the connection of our deepest, loving, nurturing self to our children's Divine nature. Gratitude - Opens the heart allowing gratitude to flow out to the universe. A gift and offering to the universe for all that it provides. Ground - Provides a stabilizing, grounding effect in the body. Grounded While Soaring - Grounded While Soaring is my newest essence that is very powerful. It provides a grounding effect while soaring to even greater heights. It assists you in expanding your business and your life. This does promote changes, so be ready for shifts to happen! Harmony - Promotes inner harmony. Iceland Spar - This crystal cleanses and aligns all of the chakras and assists one in communication in difficult situations. Jetlag Relief - Helps alleviate symptoms of jetlag. Joy - Assists in experiencing more joyfulness in one's life. Light - Fosters the sense of taking a tropical vacation. Assists in providing "Light" to the body especially on cloudy days. Love - Love provides loving from the inside out. Opening to experience more love of yourself, opening barriers and protective armor accumulated in life. Allowing more love to come in and flow out. Supporting you living with more joy and love now. Manifest - Stimulates focus and visioning of personal desires. Motivation - Helps one to dissipate lack of motivation. Muscle Ease - Brings comfort to tired, stiff, sore, aching muscles. Pain Ease - Encourages healing physically, as well as emotionally, mentally and spiritually. Most healing takes place when the body is resting. Panic Relief - Assists in relieving emotional distress, fear and panic. Passion - Awaken and enhance passion for life and between couples. Performance - Diminishes performance anxiety. Power* - Invites the power of the Universe to oneself for achieving one's highest goals. *Actual ruby crystal in essence. Present Now - Helps bring one current and physically into this moment. Protection - Keeps one's energy field clear from absorbing unwanted energy from others. Radiation Clean - Helps dissipate harmful exposures to X-rays, microwaves, computers, cell phones and more. Rebirth - Assists in bringing abundant support for renewal on all levels. Romance - Encourages attraction and spices up romance. Separation Ease - Eases anxiety at time of separation from loved ones. Serene - Calms anxiety and nervous tension. 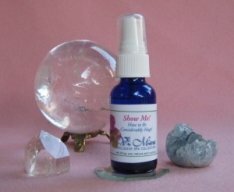 Shining Spirit - Helps bring forth the light of the soul/spirit to greater consciousness. Show Me! - How to Claim Your Whole Space into your BIG Self Aligned with Your Direction and Highest Truth! Also available customized for a unique special experience with this essence! Click here to find out more: Show Me! Soul Purpose - Helps align you with your soul purpose. Also helps one connect with past lives and removes negative energy. Spirit Release - Helps to bring forth one's zest for life. Submissive Ease - Balances a sense of one's place in the world. Surrender - Promotes letting go of what isn't working allowing one's next step to appear. Helps dissipate resistance on all levels. Great for new eating habits, procrastinators, recovery from any addictions, and releasing old habits. Great to use before "Acceptance"
Transition - Assists making changes with comfort and ease. Great to use when seasons are changing, moving to new house, office, town/city, country, school, career, divorcing, recovering from illness or injury. Trust - Dissipates feelings of betrayal and mistrust. Wealth - Opens conscious levels to all of the abundance of the universe. Assists in attracting wealth in one's life by creating a new relationship with money as energy. It accentuates living the "good" life everyday. Also see Manifesting Wealth Now! Package. Whiplash Relief - Helps release inflammation, muscle tension and trauma in neck and shoulders. Wholeness - Supports and grounds us as we clear weaknesses. Wisdom* - Allows Oneness with state of perfection of "All-That-IS". *Actual ruby crystal in essence.